There are plenty of reasons to love WordPress. However, when I examine my day-to-day usage (across my own blogs as well as others that I write for), I can see that there are certain features and plugins that I use consistently. These are things that would drastically alter my user experience if they no longer existing — things I consider essential to the way in which I blog. Most of the time I take them for granted but in this post I want to list everything I use in WordPress that I consider indispensable — features that really define WordPress for me — in the order that I tend to use them when blogging. To put it simply, without the following items, my daily WordPress experience wouldn’t be the same. I’ve spoken about Edit Flow on the blog before but it certainly deserves another mention — it is pivotal to the content scheduling on my own blog as well as here on ManageWP. 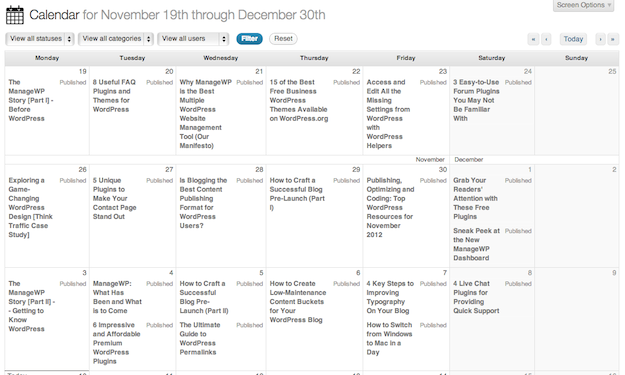 The editorial calendar from the past three weeks on the ManageWP blog. Contrary to what some people think, I do not consider Edit Flow to only be useful for multi author blogs. Any blog should be driven by a well thought-out content schedule and such a schedule is easily planned, amended and updated with the editorial calendar. But it only gets better for multi author blogs with features such as editorial comments, notifications, user groups and more. 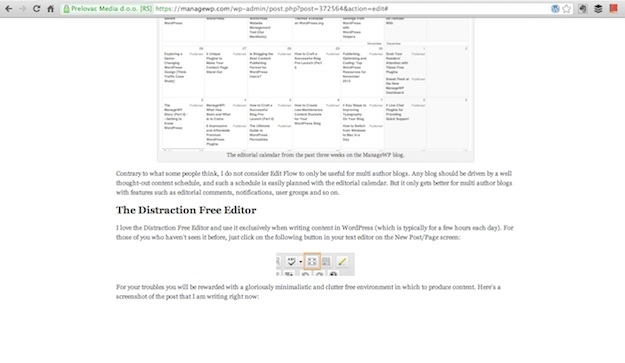 I love the Distraction Free Editor (DFE) and use it exclusively when writing content in WordPress (which is typically for a few hours each day). Although the DFE is certainly not without its faults, I consider it by far the best tool for writing available for WordPress and would recommend it to anyone. Better Internal Link Search is in my opinion the most underrated plugin available on WordPress.org. It has been downloaded less than 2,000 times at the time of writing and yet is in my opinion nearly indispensable for just about anyone who blogs with WordPress. The most basic feature limits results to posts and pages that contain your search query in their titles, rather than returning every post that contains the query in the title or content fields — this greatly reduces the number of results on sites with a large amount of content and should improve accuracy. In addition, term archives are included in the results so you can more easily link to them. Better Internal Link Search’s functionality is not just limited to what is described above but that is by far its best feature. It may not sound like much but if you find yourself endlessly frustrated with WordPress’ default internal search engine, Better Internal Link Search is the ideal solution. WordPress does a great job of automatically redirecting posts and pages when you change the permalink but the system is not perfect and of course does not allow you to manually create your own redirects. As you can see from the above screenshot, I have used it on my own blog to ensure that categories redirect properly after I have consolidated them and changed permalinks. You can also use the plugin to define links as “nofollow” and also have them open in new windows. Every time I create a new blog I install and activate this plugin. Every time I create a new post or page I use this plugin. It is, perhaps moreso than any other feature mentioned in this post, absolutely indispensable. The fact that comments moderation barely ever gets a mention is testament to how easy it is in WordPress. Once you have got over the initial buzz of actually receiving comments the whole email notifications thing can get pretty old, which is when WordPress users tend to try a different approach. 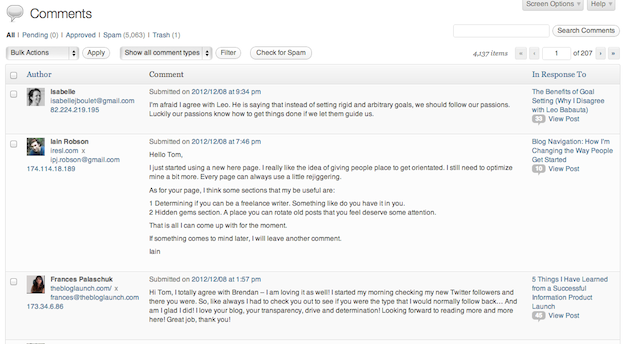 Above is a screenshot from my blog which shows all of the most recent comments in reverse chronological order. I only need to scroll down to my own last comment to see what has been added since I was last logged in and can easily address each comment in turn. Various editing and moderation options are available within one click and if you need to you can open up the post that a specific comment is associated with and answer it there. It really does make comments moderation a piece of cake. What WordPress Features Do You Consider Indispensable? So that’s my list — quite small and eclectic, which is exactly what I expected. These are the things that I use on a daily basis and would rather not live with out. However, your tastes may be very different, depending on your workflows and what you use WordPress for. So don’t be shy — what WordPress features do you consider indispensable? Let us know in the comments section! This is a great list! I’m just getting into using plug-ins but so far SEO by Yoast has been very helpful for me! Good list, for the plugin i use a lot, adminer. 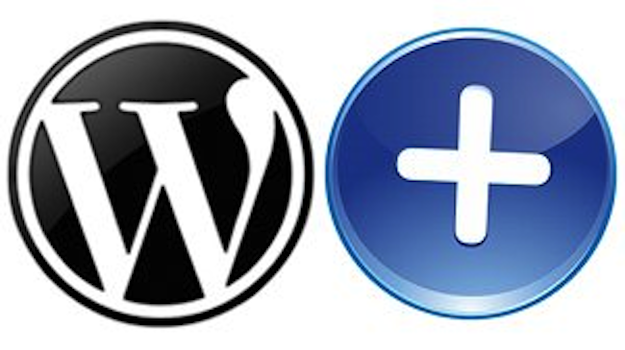 This plugin can make PhPmyAdmin in wordpress admin dasboard beside can optimize, repair database. One of my top-five indispensables has to be Widget Entries. It’s a little thing for sure, but being able to enter/edit content-art-images during creation of a text-widget makes this plug-in indispensable. Makes it easier for me. And, more importantly, makes it easier for clients as well. I use MyCurator each day, which pushes targeted content to me that I’ve trained it to discover. It makes it easy to follow through on my daily curation efforts. http://wordpress.org/extend/plugins/mycurator/ (Disclosure: I wrote it, but many users use it daily too!). Just to be clear, 4/6 of your favorite features aren’t actually features but are, in fact, extensions to WordPress. That said, I agree wholeheartedly with your list as I use all of the same tools on a regular basis. The plugin Codestyling Localization is one of those plugins I use a lot. It makes it way more easy to translate themes and plugins into other languages.